Add ground chicken, Chinese 5 spice, 1 T soy sauce, mirin, 1 T fresh ginger, and 1 tsp Sriracha in a sauce pan, and water cook on medium-high heat, breaking up chicken into small pieces until chicken is well done, about 7 minutes. Reduce and simmer until water is evaporated. In another skillet, heat broccoli slaw over medium-low heat, with a few tablespoons of water (CBT TIP: many vegetables can be sauteed with just a bit of water to keep them from sticking, rather than adding a fat to the pan), can of bamboo shoots, lemongrass, 1 T ginger, mushrooms, and 1 tsp rice wine vinegar, and saute until slaw is tender, about 5-7 minutes. In a small bowl, whisk sesame oil, 1 tsp soy sauce, honey, ketchup, 1/2 tsp rice wine vinegar, 1 tsp fresh ginger, 1/2 tsp sriracha (optional). 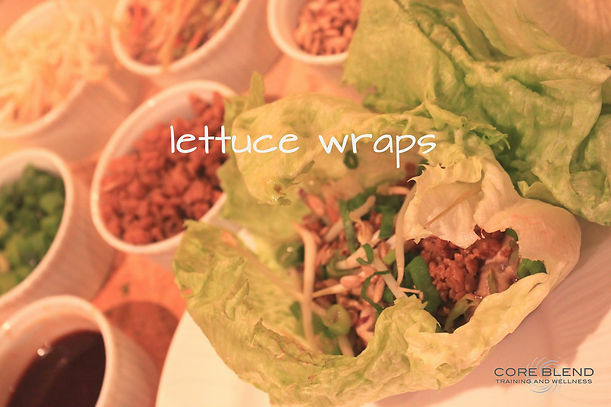 Serve by putting each component in a bowl and stacking lettuce leaves, so everyone can build their own delicious wrap! Enjoy! 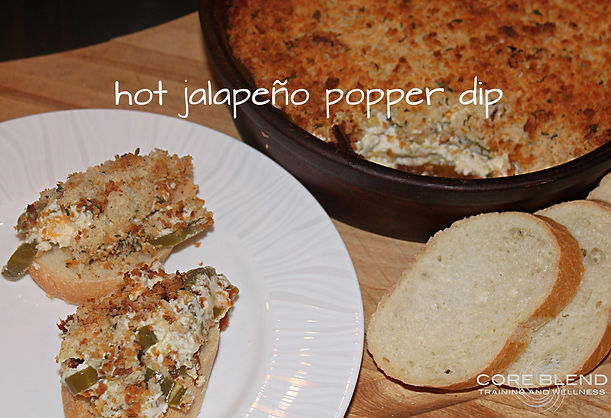 Mix add ingredients but bread crumbs together and spread into a baking dish. Top with panko bread crumbs and bake at 325 for 25 minutes or until golden brown! Enjoy! 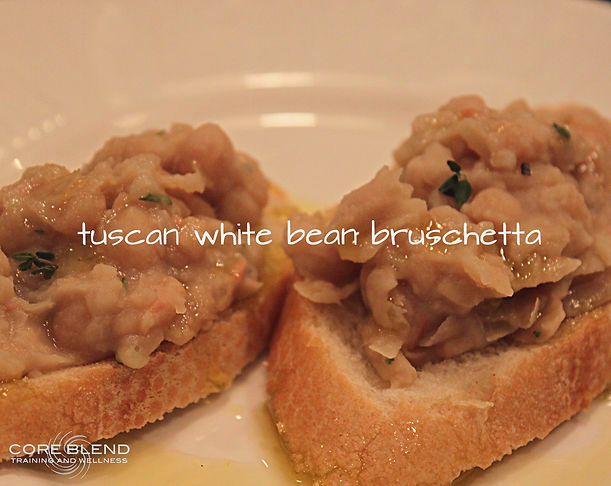 This week in Healthy Tailgating: Tuscan White Bean Bruschetta! In less than 10 minutes, you could be enjoying a warm, earthy, and slightly fancy tailgating treat. The bruschetta topping can be prepared ahead of time and served at room temperature, but it is most delicious when warm. Place baguette slices on a baking sheet and toast in oven for 4 minutes per side, at 325, or until lightly toasted. Once toasted, remove from oven and use whole peeled clove of garlic to gently rub the surface of toast. While bread is toasting, heat shallots and garlic in 1/2 tsp olive oil for 2-3 minutes in a medium saute pan, until shallot is translucent. Add beans, and begin to mash with the back of a wooden spoon or potato masher. Add herbs and sea salt, and continue mashing until most beans are mashed and mixture is warmed through. Top toasts with spoonful of bean mixture, and top with drizzle of good olive oil. Keeping it simple and delicious this week for Healthy Tailgating. Eating foods in a variety of flavors and colors helps to ensure a great balance of nutrients. We’re stacking up pomegranate seeds, strawberries, apple, grapefruit, orange slices, cantaloupe, pineapple, banana, grapes, and blackberries! Marinade chicken breasts overnight in balsamic vinegar, 2T oregano, and 4 whole garlic cloves, occasionally turning marinade over the chicken. When ready to assemble, lightly shake marinade from chicken and grill, 3-4 minutes per side, or until cooked through. Allow to cool about 5 mintues, and dice. In an food processor, mix feta cheese, juice of 1 lemon, 1 TBSP Italian seasoning, chopped garlic cloves and splash of juice from the jar of Pepperoncinis (opntional, but oh, so good). 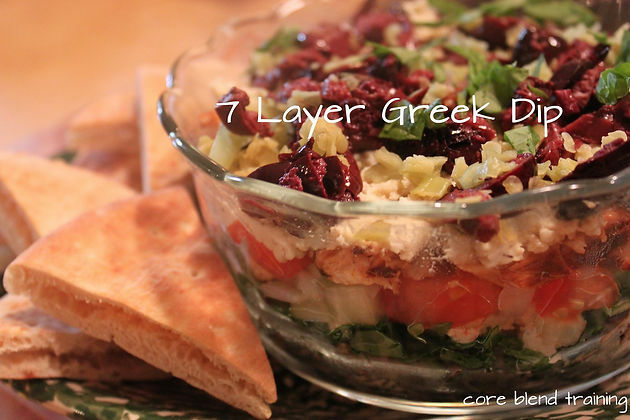 Mix until smooth, leaving some chunks of feta. Combine diced tomato, diced cucumber, and minced onion. Half of the chopped chicken, arugula, half of the feta mixture, mixed veggie layer, remainder of chicken, remainder of feta mix, and top with chopped olives and perpperoncinis. Season pita triangles with a drizzle of olive oil, and a pnch of salt+pepper. If you If you’re on a grill, throw the pita triangles in a grill basket and toast. You can also place on a baking sheet and toast in the oven at 350 for about 10 minutes, turning over once during baking. Enjoy! Low in fat and full of flavor, this is a delicious alternative to tomato salsa. Serve with chips and veggies, or use as the perfect sauce to top chicken enchiladas. In a roasting pan, place whole tomatillos, onion wedges, and garlic cloves, and broil in the oven for 3-4 minutes, until lightly charred. Flip tomatillows with tongs and broil an additional 3-4 minutes. Transfer tomatillos, onions, garlic, and remaining ingredients to a food processor, preserving the liquid in the pan. Blend well, adding roasting liquid until your desired consistency is reached. Garbanzo beans, also called chickpeas, are nutritional powerhouses! A great source of protein, iron, fiber, magnesium, and folate, they also have the added benefit of being naturally low in sugar, making them a carbohydrate choice that’s low on the glycemic index. 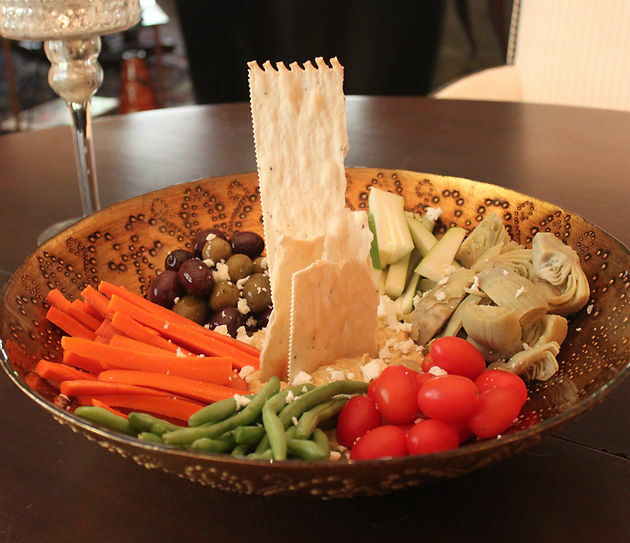 Skip empty calorie crackers, and serve with a variety of vegetables. We like to surround hummus with green beans, zucchini sticks, carrots, artichoke hearts, grape tomatoes, and olives, and top with a small sprinkle of feta. Add all ingredients to a food processor and blend until smooth. If using canned beans (one 15 oz can works, here), drain and rinse well in a strainer before using. Extra water, or cooking liquid from beans, may be slowly added if you prefer a thinner texture. Mix up this basic recipe by eliminating spices above, and adding sun-dried tomatoes, roasted red peppers, or a seeded jalapeño.